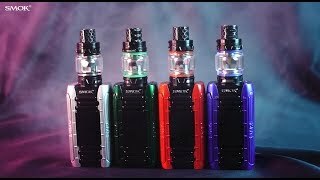 SMOKTech continues to stun the market with the uniquely designed SMOK E-Priv 230W TC Kit with TFV12 Prince Tank inspired by high performance race car engines. Between the E-Priv Mod and all new coils with mesh heating elements, this incredible kit boasts extreme power and efficiency unparalleled by any preceding SMOK product. The Zinc Alloy chassis of the E-Priv Box Mod has laterally stacked horizontal bars on the front panel and five consecutive convex markings on the back. These uniquely designed panels give the SMOK E-Priv Box Mod a look very similar to the engine of a high-powered racecar. Going along one side of the mod is SMOK’s popular elongated firing bar, which blends in with the overall design to keep it visually symmetrical. The E-Priv Box Mod stands at compact dimensions of 31.88 x 47 x 85mm that, together with the Zinc Alloy construction, add up to a weight of 194.5g. A newly designed user-friendly interface allows you to easily navigate the large centered 1.45" inch HD TFT display screen using two distinct adjustment buttons. For personalization, this screen can appear in six distinct color options while displaying the output mode, vaping effect, puff counter, puff timer, and individual battery life indicators. Running this detailed display screen and intuitive user interface are dual 18650 batteries (not included) installed through a bottom hinged battery access door. To charge this device and upgrade firmware, SMOKTech has implemented the industry standard Micro-USB port with quick-charging capability. With a standby current of less than 300uA and a charging voltage of 5.0V, the E-Priv Box Mod has an operational input voltage of 6.4-9.0V and an output voltage of 0.5-9.5V. Within resistances of 0.1-2.5 ohm, Variable Wattage mode has an output range of 1-230W and you can choose your desired vaping effect from Hard, Normal, or Soft. The Temperature Control suite of the E-Priv allows you to vape between temperatures of 200-600°F (100-315°C) while using Ti, Ni, or SS heating materials within resistances of 0.05-2.0 ohm. To save your favorite settings and get right to vaping without scrolling through each mode all over again, simply use one of the many Memory outputs of the E-Priv. Safety features of the E-Priv include intelligent atomizer recgnition, a ten second cut-off, short circuit protection, over-heating protection, puff monitoring system, and low battery warning. Attached to the robust E-Priv Box Mod by a threaded 510 connection is the equally powerful and authoritative SMOK TFV12 Prince Sub-Ohm Tank with a massive 8mL e-liquid capacity. Made of superior Stainless Steel and durable Pyrex glass, this tank has compact dimensions of 28 x 63mm and a lightweight of 60g. Attached to the top cap with o-rings is SMOK’s patented Cobra 810 drip tip with its wild outlook and unique texture for a comfortable feel on your lips while increasing airflow. Controlling the overall airflow are dual bottom adjustable airflow slots along the base that be fully opened or fully closed and everywhere in between. This gives you plenty of options to customize airflow whether you prefer a tighter draw or a wide-open draw. To fill the massive 8mL convex glass reservoir, simply push and twist the top cap counter clockwise. This leak-resistant design exposes a large fill port big enough for any e-juice dropper bottle without making a huge mess. Pre-installed inside the TFV12 Prince Tank is the 0.2 ohm V12 Prince Dual Mesh Coil with parallel mesh heating systems for even heat distribution and a quick ramp up time. The new V12 Prince Dual Mesh Vape Coil is rated for use between 50-80W but is recommended for best use at 65-75W to achieve a balance between flavor and cloud production. Included with this kit is the new 0.17 ohm V12 Prince Max Mesh Coil rated for use at higher wattages of 70-130W. SMOKTech recommends the V12 Prince Max Mesh Coil be used between 100-120W to bring you cloud production like you’ve never seen before while maintaining rich flavor. Also included with this kit is a rubber anti-slip ring that not only assists with disassembling your tank but it also protects your tank and acts as a distinctive ornamental decoration. Mesh coils are taking over the industry as they prove to be extremely efficient and capable of withstanding high wattages without causing a burnt taste. If you want power and efficiency, then the mighty SMOK E-Priv 230W TC Kit with TFV12 Prince Tank is the kit for you. With a massive 8mL capacity, you will thoroughly enjoy each and every draw while getting the most from your favorite e-juices.